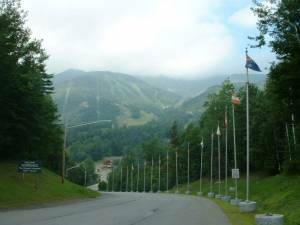 Wilmington, NY – The 20th annual Whiteface Oktoberfest, at Whiteface Mountain Ski Center in Wilmington, N.Y., is scheduled for this Saturday and Sunday. During the two-day festival, the Olympic mountain dusts off its lederhosen, fires up the oompah band and enjoys a tall mug of German beer. But it’s more than that… it’s fun for the entire family with activities including original vendors, arts and crafts, children’s amusement rides including the popular hay ride and inflatables, Bavarian food, drink and entertainment. Get ready for the upcoming skiing and riding season at Whiteface with ski shop sales in the Ausable Room. Of course the Whiteface Oktoberfest offers traditional German music from Die Schlauberger performing under the entertainment tent outside the base lodge each day, the Lake Placid Bavarians who have been performing traditional Bavarian music in the north country for the last 20 years, and Ed Schenk on the accordion. The Cloudspin Lounge will also feature music from Schachtelgebirger Musikanten (Scha-Musi) and performing at their third Oktoberfest will be Spitze and The Alpen Trio. Spitze will also get the audience involved with their alpine show which features cowbells, the alpine xylophone, and the alphorn and of course – yodeling, while the Alpen Trio will greet Cloudsplitter Gondola passengers at the summit of Little Whiteface with the alphorns. Finally, Whiteface also welcomes back Schachtelgebirger Musikanten for the seventh year to the ski area’s Oktoberfest. The duo will be performing in the Cloudspin Lounge on Saturday and on Sunday. Other entertainment to be found during the festival include the Alpenland Taenzer, nominated and accepted as members of the “Gauverband Nordamerica,” a nationally and internationally known organization promoting German Heritage throughout the United States and Canada, and “Kindergruppe,” comprised of eight to 10 couples ages 3-19. Older members of the Kindergruppe also dance in the adult group. Guests can also drive the Whiteface Mountain Veterans Memorial Highway and enjoy spectacular 360-degree panaromic views of the region, spanning hundreds of square miles of wild land reaching out to Vermont and Canada from the top of the state’s fifth highest peak. Oktoberfest will be held Saturday from 10 a.m. to 7 p.m. and Sunday from 10 a.m. to 5 p.m. A complimentary shuttle service will be provided both days. Departure from the Olympic Center Box Office in Lake Placid takes place at 11 a.m., 1 p.m. and 2:30 p.m. Departure from Whiteface to Lake Placid takes place at 2 p.m., 4 p.m., 5 p.m. (Sunday only), 6 p.m. (Saturday only), and 7:30 p.m. (Saturday only). From Wilmington pick-ups are at noon both days with the return shuttle leaving Whiteface at 5 p.m. Admission costs $15 for adults, $9 for juniors and seniors and gondola rides are $12. For more information about ORDA’s 20th annual Oktoberfest, log on to www.whiteface.com/summer/events/octoberfest.php.